The South African painter Ryan Hewett defies the portrait genre with representations based on his personal experience, that explode in powerful chromatic matter distorting the faces, in order to make them universal examples of the human condition. By observing Ryan Hewett´s portraits, the creative axis of his work is suddenly manifested: his pictorial gesture never searches for a purely aesthetical component, nor tries to reach out for a committed representation of reality (even from far away). Instead, there are always multiple hidden aspects that are not revealed. “I am not trying to portray a person as he appears visually –Ryan affirms–. It is always about looking underneath the face, in search of psychology, of history. Looking into the deeper being. My paintings are a representation of me: I pour myself onto the canvas.” It is due to this that, perhaps, we could think about some type of physiognomic investigation. In other words, an attempt to explore the subject´s psyche reproduced through the analysis of his physical traits. Anyhow, the first evident sensation seeing his work is like facing a visual stimulus that is more related with a profound component that is intimate and spiritual rather than vaguely scientific. A kind of neo-expressionism which, as you will see, tries to investigate the human being through a combination of the personal and collective. “Portrait painting has always captivated me. I connect with my human subjects in a way that I cannot with other subjects: the human face and human psyche guide my hand and dictate my paintings. The human portrait is vulnerable –Ryan continues. Each mark I make on the canvas is as important as the next and every single one of them tells a story, explores and explains the person that I am painting.” It seems like a creative condition that breaks the distance between patient and analyst, subject and observer, portraitist and portrayed, artist and viewer, is moulded; melting appearances into a plastic chromatic implosion where every story, every memory and every experience has a place, foremost, Ryan´s own. A deep and powerful osmosis, between the artist’s personal experiences and the hidden inner being of the subject painted that sublimates, through a pictorial act that is carried out almost in a trance on the canvas that the artist attacks. This way, in his last series Untitled (which follows up Genesis and Enlighten, exhibited in Cape Town and London), Ryan connects this dramatic limited dimension between the experiential, the spiritual and the private with a universal meaning. He defies these concepts through an apparently contradictory representation of key political and religious figures of modern history. Apparently incoherent, because even though the subjects could be easily labelled as “icons” (and consequently be separated from the profound dimension that Ryan looks for), but the style, far from configuring itself as a political speech, yearns to finally de-construct these well-known figures and turn them into ordinary people. Faces like any other. Faces that, once more, reveal themselves as containers of memories, experiences and stories. 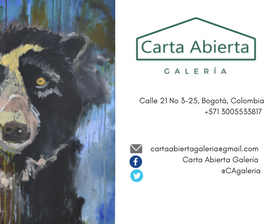 Portraits that, once again, act as threshold into the complex personal exploration that characterizes the artist´s poetics. Matter, texture, memory, absence, life. It is the perspective that manages to put these characters at the same level, precisely because it reduces both the positive and depraved to the bare bones. To the simple being. To that ineluctable condition that pushes them towards annihilation. In other words: to the simple memory, in a more ancient than historical sense. To the appearance of an experience that fades and reappears through another´s practice (the painter, the spectator). It is precisely the material texture that always characterizes Ryan´s paintings –obtained with layer after layer of oil paint–that most profoundly shows this intention. Faces transform into a watery photograph that erases itself, into a lined mural laid out by other drawings and cracks, into a rock that liquefies, into a blood clot, into dry meat that will inevitably end up rotting, into memories that fight against time. It is the human being facing the passing of existence. The human being against its own final demise. 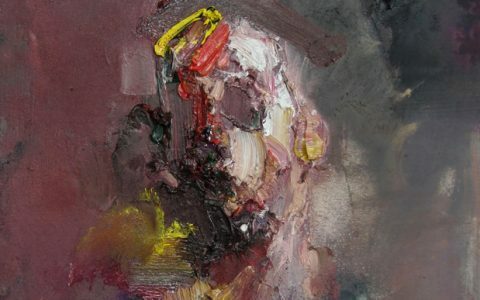 In conclusion, when Ryan Hewett faces the white canvas and the countenances that will appear on them, he pushes himself to discover (or re-discover) his inner being, his own memory and experience; whilst –after this intimate discovery–, he manages to outline a road that belongs not only to him, but to every human being. It is, in the end, the road of life itself in its most universal image, uneven due to each mark that originates in its travel. Until the unavoidable ending.